The YES2017 will be the 2017 annual gathering of Nigerian young entrepreneurs and youths at all stages of business development: business leaders, youth entrepreneurs, mentors, budding entrepreneurs, investors, government officials, to discuss and x-ray the challenges and solutions proffer to youth entrepreneurship and empowerment in Nigeria demonstrating YEN’s continued efforts and commitment in fostering youth entrepreneurship development and empowerment in Nigeria for sustainable growth and economic development. YES2017 will be hosted in the six geo-political zones of Nigeria as follows: Lagos, Portharcourt, Yola, Kaduna, Enugu and Abuja with over 20,000 delegates, 1000 exhibitors and 60 speakers. YES2017 will be the biggest entrepreneurship event to be ever hosted in Nigeria and will feature mentorship, conference, summit, business funding, networking opportunities, exhibition, and town hall meetings. YES2017 will also empower some selected 8,000 youths across the federation; 500 youths will receive business funding/business tools through Young Entrepreneurs of Nigeria (YEN) and other YES2017 partners, 500 youths will receive free business websites, 1000 youths will receive mentorship and 6,000 youths will receive special business training/capacity building to support start-ups and enable existing youth entrepreneurs boost their respective businesses across the country. Youth Empowerment Summit 2017 is themed Youth Empowerment: A Panacea for Unemployment, Economic Growth and Sustainable Development. · YES2017 South-West Lagos, 27th-28th September 2017. · YES2017 South-South Portharcourt, 5th-6th October 2017. · YES2017 North-East Yola 11th -12th October 2017. · YES2017 North-West Kaduna, 18th -19th October, 2017. · YES2017 South-East Enugu 26th-27th October 2017. 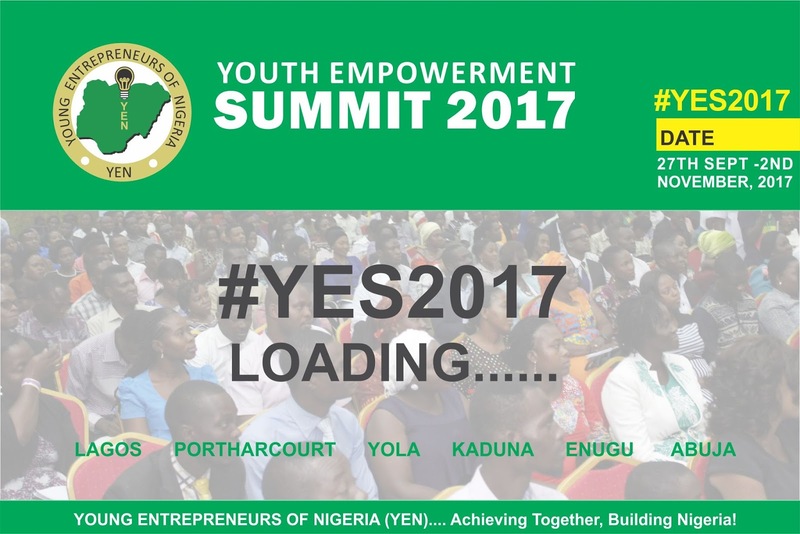 · YES2017 North-Central Abuja 1st -2nd November, 2017..
Also, the YES2017 team will be submitting a comprehensive Summit Communiqué to the Federal Government and State Governments of Nigeria in line with the findings of the summit (challenges and solutions) to youth entrepreneurship development and empowerment in Nigeria across the six geo-political zones of the federation.